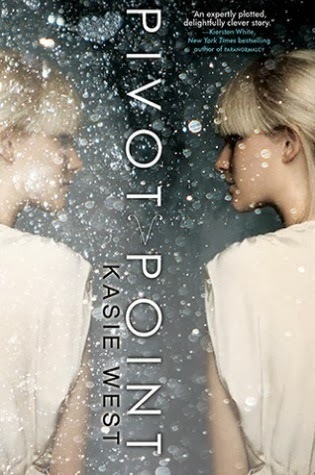 Pivot Point is up for a Whitney Award in the Young Adult Speculative Fiction category, against Brandon Sanderson's Steelheart and J.R. Johansson's Insomnia, among others yet-to-be-reviewed-here. Addie Coleman lives in the Compound, a self-contained city entirely populated by people with paranormal gifts. She has a great best friend, a popular boy starting to show interest in her, and life seems to be going pretty well, until her parents announce that they are getting a divorce. To make matters worse, her father is leaving the Compound to live among Norms, people without paranormal abilities who don't even know such things exist, and Addie has to choose whether to stay with her mother or leave with her father. Addie has a distinct advantage in making a decision, however. She is a Searcher, someone with the ability to see the future down two alternate paths. All she has to do is look a few months down the road, see which option is more appealing, and pick that one. Simple, right? Of course, there's a catch. While to an outside observer the process only takes a few minutes, Addie essentially has to live each of the two possible lives in her mind, feeling every emotion, experiencing every sensation, for the entire time period. The chapters in the book alternate back and forth between the two options, a gimmick I frankly thought would be distracting and difficult to follow. I was pleased and surprised to discover I was wrong and that it was easy to jump back and forth between the two story lines. It's interesting to compare the similarities and differences between the two paths as similar events occur in each line, and Kasie West does an impressive job making the stories even and balanced. The eventual outcome of her two options is far more life-or-death than she could have imagined and, to avoid spoiling anything, I'll just say she finally makes the only possible choice, though it involves personal sacrifice and heartache. Even with her paranormal ability, Addie comes across very much as an average girl, someone I'd like to hang out with. She had me when she identified her five favorite words: "My bookcase is all yours." There's some teen angst and coming-of-age stuff - "without my ability, I'm not sure who I am" and "I never cared what people thought of me before" kind of stuff - but that's par for the target demographic. On the whole Pivot Point is an engaging story about the choices we are faced with, how we make decisions, and the effects of our choices on others. Pivot Point is the first in a planned two-book series and I just got the sequel Split Second from the library yesterday, so I'll be sure to let you know if this is one to keep on reading!